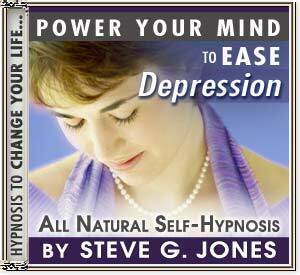 Power Your Mind to Control Sadness and Ease Depression! Sadness happens to all of us sooner or later. It can be over getting a bad grade in school, having a breakup with a loved one, loosing someone to death. No matter what form sadness comes in I want you to understand that this is a normal process. There is a system to grieving. However, this recording is designed to save you months or perhaps even years of time in a therapist's office. Consulting with your healthcare professional before using this recording is strongly suggested. By using this recording, you will find that you will almost immediately feel better about yourself. For deep and lasting results I suggest listening to it for 21 nights in a row every night as you go asleep. You don't have to worry about staying awake to hear what's on the recording because the messages go to your subconscious mind anyway and the hypnotherapy is highly effective whether you remain semi-conscious or fall completely unconscious while listening. I always encourage people who think they might be depressed to seek help in some way. No one should go through the pain and suffering of living with depression. It's important to recognize the symptoms and seek professional help. Hypnotherapy is a natural approach that helps people relax and change the way they think about themselves and life in general.